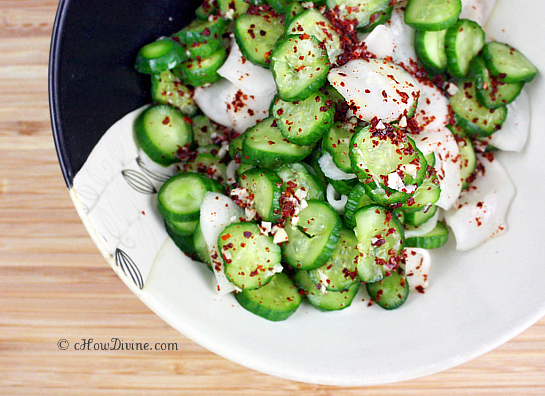 There’s nothing like some refreshing Korean-style pickled cucumbers and/or radishes in the summer time. They are sweet, sour, and if you are so inclined, spicy. They keep for days, you can eat them with (or on) anything. They make a great side for any meat or poultry dish. And they are great on Asian noodles, bibimbap, burgers, tacos, or sandwiches. I don’t know if you’ve ever had tong dak (Korean rotisserie chicken) in Korean pubs. If so, you may have tried the sweet and sour radish side dish that’s often served with it. I used to love eating those sweet and sour radish cubes more than the chicken itself. This dish is very similar in taste to those pickled radish cubes, but with the added flavor of garlicky spiciness. Like many of my other favorite summer dishes, this is very easy to make. In fact, you can make it in minutes. And you can adjust the sourness, sweetness, and spiciness according to your preference. It can be served soon after preparation – once chilled. But it tastes even better the day (or even two) after. If you are hosting or attending a summer barbecue, just make it the night before and refrigerate overnight. And serve it as a side or on burgers in lieu of store-bought pickles. It’s absolutely delicious. Note: You can omit the garlic and gochugaru if you want a milder version without the spiciness. In a small bowl, stir together minced garlic, rice vinegar, agave or honey, and gochugaru. Set aside. Place the sliced cucumbers and daikons in a large non-reactive bowl. Sprinkle sea salt on the sliced vegetables. Mix until salt is well distributed. Let it sit for 15-30 minutes. This will draw water out of the vegetables and make them pliable. Rinse the cucumbers and daikons. Don’t over rinse. You just want to rinse away excess salt but maintain the slight saltiness for flavor. Drain the cucumbers and daikons. Squeeze out excess water. Just give it a light squeeze using a paper towel. This will make them extra crunchy. Add the vinegar mixture from step 1 to the vegetables and mix well. Refrigerate for at least 30 minutes for the flavors to come together. Serve chilled. You can mix in some chopped green onions before serving. This can be prepared a day before and refrigerated. Thank you so much beti! 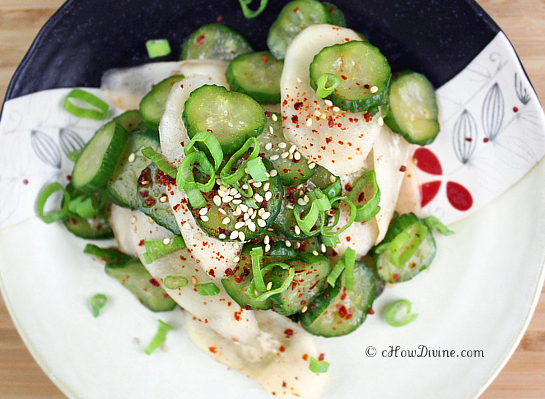 These cucumbers and daikon radishes are really refreshing. Hope you give them a try. Thanks Sook! You are always welcome here! 🙂 Hope you like these! It’s been so steaming hot lately! I hope these help to keep you cool. Come to think of it, I don’t think I’ve used sugar in ages! I’m so excited to have found your blog. My husband is 1/2 korean and while his mom cooks everything there are only so many times we can bug her with questions so I’m excited to find some recipes we can try on our own without bugging her expecially this one it is one of my personal fav side dishes. Glad to be of help Amber! I’m sure your MIL enjoys giving you advice on cooking tho. 🙂 My grandmother and my mom both loved it when I called them for help. Hope you like this dish!